Michael Franti performs at the Asbury Park Music and Film Festival. This photo was posted on his web site, michaelfranti.com, after the event. Michael Franti now has an upbeat, inspirational film to go along with his upbeat, inspirational music. “Stay Human” — which premiered at the Paramount Theatre, April 27, as part of the Asbury Park Music and Film Festival — is a documentary about Franti and some exceptional people he has met, all around the world. People who are making a difference, like Robin Lim, a Filipino-American whose foundation offers free prenatal care, birthing services and medical aid to those in need in disaster zones; and Arief Rabik, a scientist in Bali who is exploring ecologically sound ways to use bamboo. In the most moving segment, Franti spends time with Steve and Hope Dezember, a married couple who hold onto their life-affirming spirit despite Steve’s heartbreaking battle with ALS. 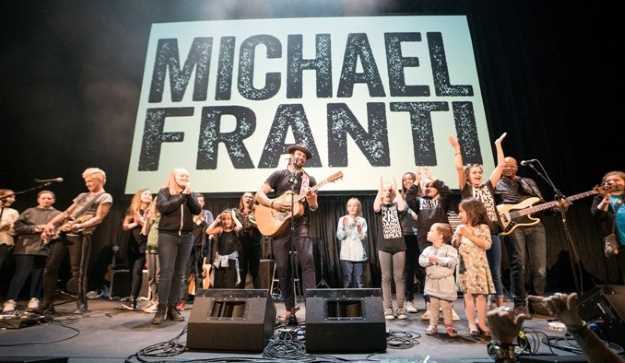 Franti — who also released an album titled Stay Human in 2001, and is working on Stay Human II — has made lasting connections with these people while traveling the world as a touring musician. And the focus of the film is on them. It also tells Franti’s life story — or, at least, kind of sketches the outline of it — and explores his evolution as an artist and activist, but that’s secondary. There’s some music in it, too, but that’s almost incidental. At the Asbury Park Music and Film Festival, the screening was followed by a question-and-answer session with Franti, and then a celebratory unplugged set that ranged from the uplifting anthem “Nobody Cries Alone” to love songs like “Say Hey (I Love You)” and “Just to Say I Love You.” Franti was backed by two members of his band Spearhead (guitarist Jay Bowman and bassist Carl Young), plus some electronic percussion, and was sometimes also joined by audience members who had been invited onstage to sing and dance to the music. It was as enthusiastic a crowd as I’ve ever seen. Franti is certainly not a new artist: He’s been around for 30 years or so. And yet it feels like there’s something swelling around him. Some kind of movement or, at least, a mini-movement. It may not ever change the world, or make a huge pop-culture impact, but it’s got a joyful momentum of its own, and “Stay Human,” the film, is part of it.